Choosing a bed alarm for elderly people or children struggling with enuresis and other issues can be difficult when there are so many different types and options out there. We’ve researched and reviewed a variety of best-selling products for issues like these to help you find a solution ASAPee! First, take a look at the following features to consider when looking for an enuresis system. Age - Different alarms can be made for the needs of children, the elderly, or both, depending on your needs. Wireless - Wireless bedwetting systems can be more comfortable and convenient than corded designs. 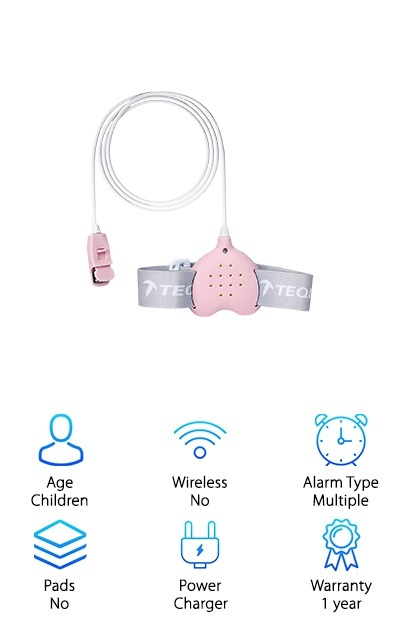 Alarm Type - Sound, vibration, lights, and combinations of these help you to find the best option for your patient or child. Pads - Sensor pads are placed on the bed rather than attached to the person for comfort and mattress protection. Power - Most bed alarms are battery-operated, but some plug into an outlet or can be recharged while not in use. Warranty - The warranty on a product is often an important indicator of quality and something to consider for long-term use. Try to hold in your excitement--it’s time to get into the reviews! Our bed alarm review list encompasses a wide variety of options for children and the elderly. If you’re in a hurry, our top pick and budget pick might be all you need. But keep reading if you want to compare a wide range of options. Your mornings spent changing sheets are about to change for the better! Our overall top pick doesn’t just provide an alarm system: it also provides access to an interactive online program customized to your child’s specific issues and needs with periodic check-ins from the Therapee support team. Especially for children that feel ashamed or unhappy about bedwetting, the Therapee interactive program can provide positive reinforcement by tracking progress while providing tips and ideas tailored to the individual child. The actual alarm system itself involves a waterproof pad placed under the sheet with adjustable sensitivity levels to account for sweat and humidity, plus an attached alarm that can be set next to the bed. 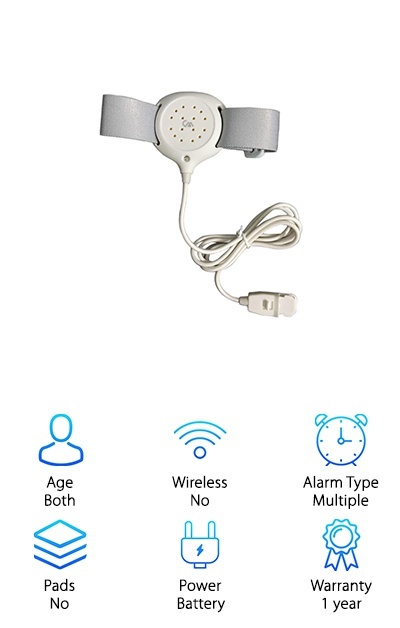 This alarm can be set to different volumes and ten different sounds, all playing loudly and clearly through the speakers. The pad measures 24x20’’, so it’s a great choice for restless sleepers and has a wide sensor area. But not only are you getting a high-quality bed alarm, you’re also getting the support and know-how of the Therapee team! Our budget pick for the best bed alarm with a low price is the Cumizon Tech Bedwetting Alarm. 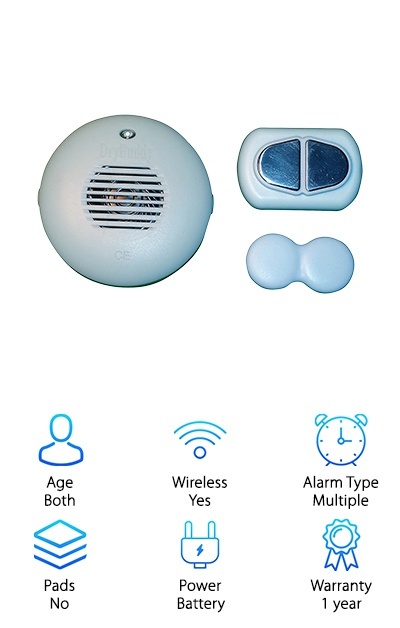 One great feature is that it combines several types of alarms to ensure quick waking time in children or adults, using sound, vibration, and light as alerts. The alarm is attached to an adjustable elastic band that can be placed on the wrist or arm. The cord connecting the alarm to the sensor can be passed under clothing for comfort and discreteness. The sensor clips onto cotton underwear and responds to the first drop of urine to help prevent bedwetting accidents. The variety of alarm types combined with the low price make this a great product for parents and caregivers looking to decrease enuresis issues. This product is a good choice for adults and the elderly as well since the design is simple and modern--no bright colors or patterns that may make it seem childish. Deep sleepers can have a lot of trouble with bedwetting since they can “adapt” to bedwetting alarm tones and vibrations. 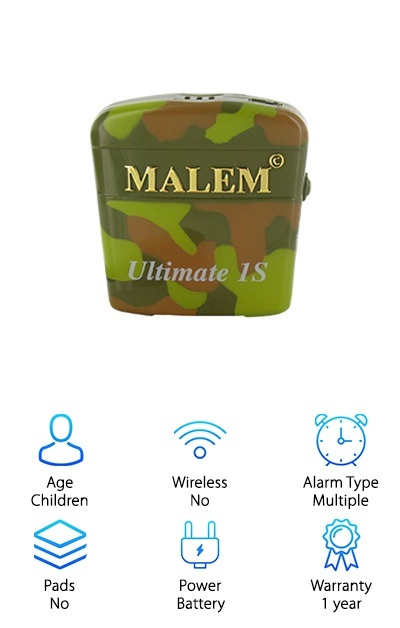 The Malem Selectable Bedwetting Alarm helps to ensure your child wakes up quickly every time with a variety of alarm options. Select from eight different sounds or the random setting. The alarm options include sound and vibration, sound only, or vibration only. A flashing light is incorporated into every setting to help speed up waking time. One unique feature of this wired bed alarm is that the secure clip-on sensor will alert you if it’s not attached correctly. That can help cut down on potentially costly mistakes! The sensor’s Quick Detect technology responds to even a drop of urine. You’ll also have access to a free smartphone app for asking questions and viewing instructional videos for help! The multiple alarm types and great sensor design make this a solid product for bedwetting issues. 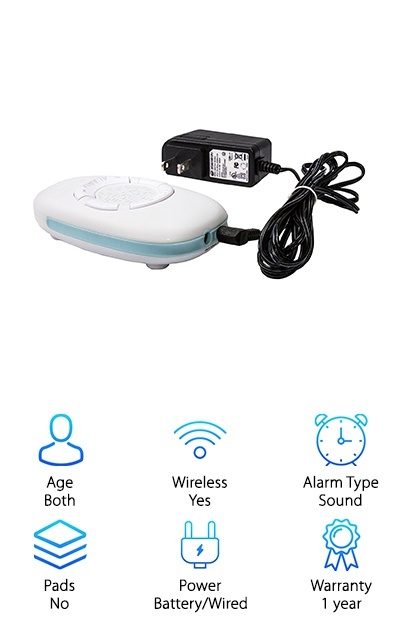 Looking for bed alarms for the elderly, but not necessarily for enuresis issues?The Smart Caregiver Wireless Bed Alarm helps alert caregivers when a patient gets up from bed at night. The bed sensor pad is available in a 10x30’’ size for patients weighing 120+ pounds and a 20x30’’ size for patients weighing under 120 pounds. The alarm can be used with three C batteries or used with an optional AC adapter, sold separately. The alarm can be set up to 100 feet from the bed sensor pad and has an adjustable volume with an on/off switch. This product is also available with a patient call button accessory. The pad is made from incontinence-resistant vinyl with foam padding. This bed alarm doesn’t sense wetness, but rather when the person gets up. As a result, it may not be the ideal solution for enuresis, but it can help caregivers know when the person may need assistance during the night. The Teqin Bedwetting Alarm provides an easy-to-use solution to kids struggling with bedwetting during the night. It comes in pink, blue, or white color designs. The alarm receiver is attached to an adjustable elastic band that is worn on the arm. A cord connects the alarm to the sensor, which clips to the underwear--no pads or uncomfortable undergarments required! Set the alarm to vibration only or sound and vibration for deep sleepers. It’s powered by a built-in rechargeable battery with an included charger rather than disposable batteries. The low battery indicator light means you won’t be caught with a dead battery. Charge it during the day and it will be ready to go at night! However, this bedwetting alarm may not be a good solution for restless sleepers, since the sensor clip could be displaced. If you’re looking for an inexpensive bed alarm to start out with, this option from Teqin might work well for your needs. The SensoPal Wireless Bedwetting System combines a convenient wireless design with the security and comfort of a waterproof incontinence pad. 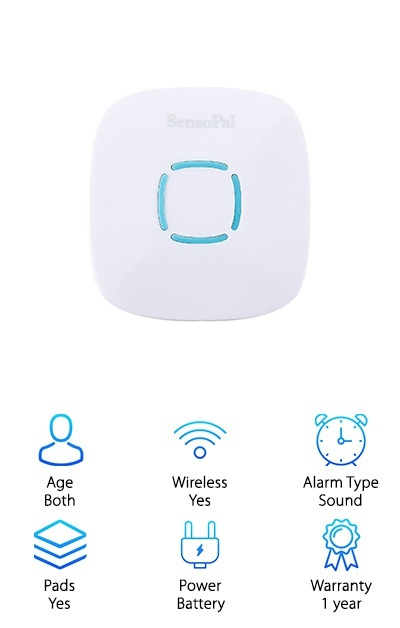 The wireless alarm can be placed up to 600 feet away from the cordless sensor pad, so it can be kept with a caregiver or parent or near the bed with the pad. You can set the volume to low, medium, or high. The pad features a cotton top layer with a waterproof bottom layer, and can absorb up to eight cups (64 fluid ounces) of liquid. This ensures that the mattress underneath will be protected. The pad is machine washable and guaranteed for 300 washes. Restless sleepers won’t get tangled up in cords or lose the sensor! 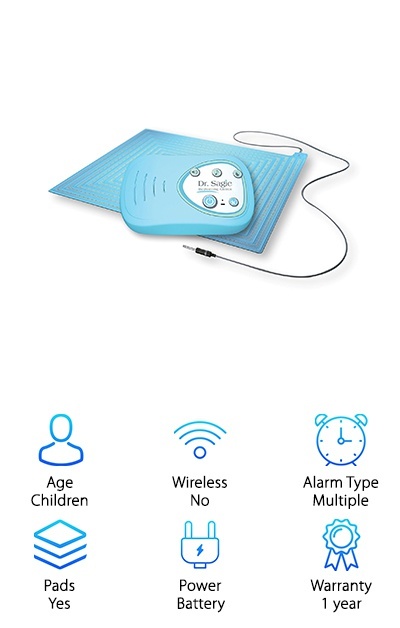 This wireless pad system works well for both children and as an elderly alarm since it is comfortable and won’t get in the way of a good night’s rest. The DryBuddyFLEX 2 wireless bedwetting alarm is an amazingly advanced option for handling incontinence and bedwetting. The simple sensor attaches to almost any type of cotton underwear with no wires or pads getting in the way. The remote is totally wireless and lets you turn the alarm off without getting out of bed. The transceiver plugs into any wall outlet and emits the selected alarm settings. The FLEX system is designed to be easy to use with multiple DryBuddy systems throughout the home without interfering with one another. The transceiver can receive a single from up to 90 feet away! Use two tranceivers to transmit across the house and alert parents or caregivers of a bedwetting incident. Choose between two alarm tones and five volume levels. A powerful corded bed-shaker can be combined with this system to provide very strong vibrations to help wake up deep sleepers. For a similar system that can be used while traveling or out in public, take a look at our DryBuddy1 review! 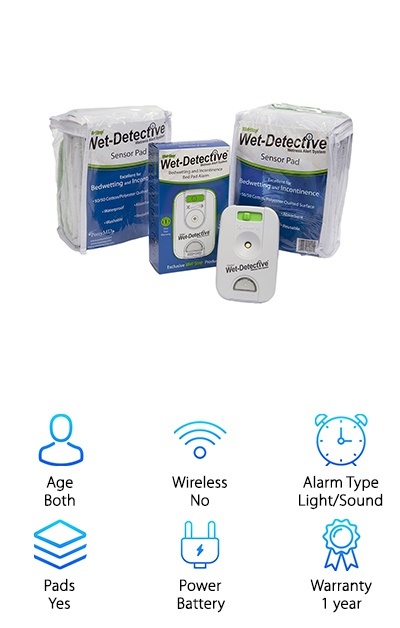 The Wet Detective Alarm provides peace of mind by protecting the mattress and bedspread while also offering a comfortable system for alerting about night-time accidents. The system comes with two waterproof, machine-washable, and reusable pads with a soft and breathable quilted surface. The large mattress pad measures 34’’ by 36’’, so it works well for restless “mobile” sleepers and for placement on wheelchairs or other areas. The alarm unit attaches to this pad via a detachable cable and is powered by two AA batteries. 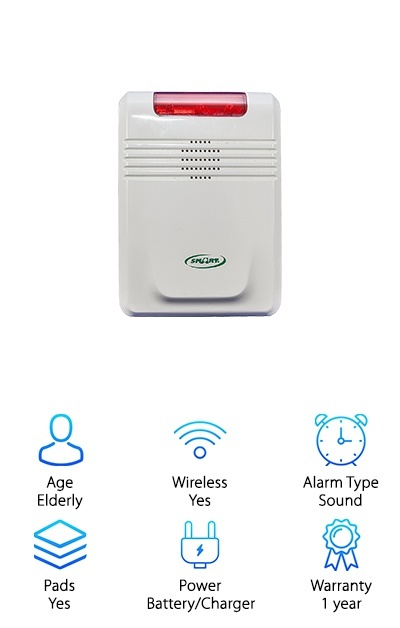 The alarm options include light only, medium alarm, alert beep, and loud alarm. The Wet Detective is ideal for those who find having wires and sensors attached to the underwear to be uncomfortable. It works well for children and elderly people who are struggling with nightly incontinence or bedwetting. The machine-washable pads are a convenient and comfortable way to manage bedwetting issues! 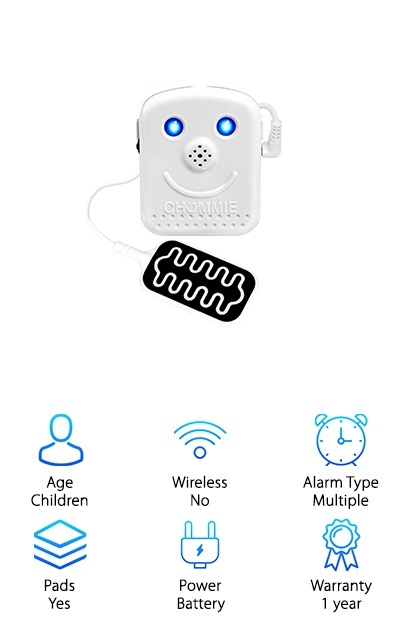 The Chummie Premium Bedwetting Alarm is designed for children and works well for deep sleepers that may adapt to typical single-tone alarms. The Chummie uses a soft silicone sensor pad that attaches to the outside of the underwear with FlexiTape. A wire connects this sensor pad to the alarm, which can be clipped to a pajama shirt’s neckline or sleeve. The pad has a large detection area and is responsive even to just a few drops, and doesn’t have sharp edges or rigid parts. The alarm is lightweight and comes with lots of alarm options. Choose from eight alert tones and control volume and vibration, as well as using the built-in lights option. This bed alarm system comes with FlexiTape as well as a motivation reward system to track and encourage your child’s progress.The combination of alert methods makes this bed alarm a great choice for helping to quickly wake up your child! Powered by two AAA batteries, the DryBuddy1 is a thoughtfully designed personal wireless bedwetting alarm system. A perspiration-resistant magnetic sensor is attached to the underwear, and the compact wireless receiver can easily fit in a pocket or purse for using the DryBuddy1 in public or on the go. The magnetic sensor can be used with standard cotton underwear or with optional patented DryBuddy wetness sensing briefs. You can change how the receiver alerts in response to wetness depending on the situation. Choose sound, sound and strong vibration, strong vibration only, or mild vibration. You can use the sound setting for night time alerts, while the mild vibration setting offers a subtle alarm while in public. The sensor can transmit a signal up to seven feet away. It is one of the best bed alarms for seniors and children who are dealing with incontinence or enuresis.